One of the most beautiful islands in the Caribbean is Saint Kitts or also called Saint Christopher, it has volcanic peaks with lush green forests and endless sugar cane fields, it offers some of the Caribbean's more dramatic panoramas. 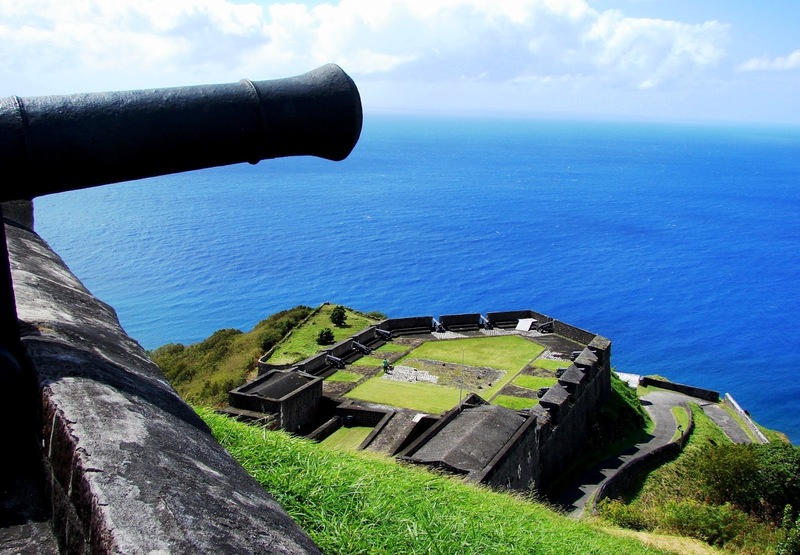 We arrived with PO cruises to the charming capital Basseterre that features many historic buildings. The island has about 45,000 inhabitants and Basseterre is the largest town with 15,500. Let me show you some beautiful views of the island, one of the good things of being in a balcony room on the deck 15 is that I could make panoramic pictures that they look like aerial photos. One of the most popular tourist attractions on the island is St Kitts Railway or also called The Sugar Train, it is a double decker train that takes you all the way around the main coastline, on narrow gauge tracks that were built between 1912 and 1926 to haul sugarcane from the plantations to Basseterre. It passes through miles and miles of sugarcane fields and also offers great views of the rainforest and beaches. Accompanied by a smartly dressed conductor and a local choir. This way to travel in the island is the main attraction, the tickets are sold very quick and in advance but we did not know this so we could not get any train tickets when we tried to buy them few days before our arrival. Nobody explained why the bottles were hanging of the tree, anyone know it? It represents the old tobacco and 250 year old sugar and rum industry. The most important historical site on the island is a massive fortress dated from 1690, situated on a volcanic outcrop, 243m above sea level and overlooks the west coast. Home of Caribelle Batik, owned and Managed by successive Earls of Romney over the centuries, this is a beautiful tour of the Historic Manor and its pristine gardens. Thanks in advance for all your comments, I really love them! Maravillosas fotos, la vegetación es impresionante, un lugar para perderse. I love these lots of space! Gorgeous nature, paradise on the Earth :-) And you are so cute in lovely summer dress. Wowww...what an awesome pictures and looks like you had a great holiday and so much fun. Love all the pictures and beautiful places. What an amazing trip! Love the cutout detail on your dress. I have always wanted to visit the Caribbean. It is high on my bucket list. Amazing. I love your pictures. Kisses! Looks like a lovely island and a fun cruise stop. Cute dress. That last shot with the two ships is really wild. Do you agree with my article about spanish foods? Thanks a lot for this beautiful summer post! what pretty skies! looks like a dreamy time! wow, so beautiful! I love the 400 year old tree pics. This place has a lot of rich history, and the views of the water are incredible. It looks like the locals are so friendly. I love the picture of you in the first picture. You look so free, it's wonderful! What a special place to visit. I went here a few years ago and had such a wonderful time - you're making me want to go back! Unas fotos magnificas! Un besazo. dream for me. Thanks for stopping by! What an amazing place, great pictures! I also love staying on the top floor of my hotel room because i of the view, and you captured this one so well , the island looks breathe taking . I would like to take a tour on the sugar tarin!!!! la verdad que hay sitios tan maravillosos en la tierra....me encanta! Wow, these pictures look amazing! It looks like paradise there! I definitely have to visit it one day, I'm in love with this place haha! This island is a paradise! You look absolutely stunning in that dress....such a beauty! These photographs are divine...so full of light and positive energy. Qué ganas de calorcito me han entrado con este post! Los paisajes son espectaculares y la naturaleza es impactante. Otro lugar para visitar sin duda! Looks so gorgeous there! I really love these photos, I wish I was there! Double decker buses really make the experience ten times better! Thanks for sharing again so beautiful pictures! So beautiful! Love all the green and palm trees and the charming buildings. Stunning shots! wow what a beautiful place!! great pics! Que fotazas!!! Muy bonito todo. Show de imagens arrasou, tenha uma semana abençoada. Always showcasing some great photos. Love it! Una preciosidad la isla, las vistas son impresionantes, una preciosa colección de fotos. Your pictures came out so great, it's obvious you had a great time! You're making us seriously want to go there for our next vacation! Thanks for your coment and for follow me! Love, love, love these wonderful pics!!!! Wow breathtaking photos! Looks like you enjoyed your trip!